Tomorrow is the Fourth of July. The 238th birthday of the United States. So how about buying it a birthday present? How about getting together with The Legal Genealogist and buying the whole darned country the best birthday gift imaginable? How about we chip in and buy a War of 1812 pension? I want one. You should too. And the Federation of Genealogical Societies is leading the charge to help us all get as many War of 1812 pensions as we can — as birthday presents for America, and as presents to ourselves and our families. So, yesterday, it launched a new phase of its fundraising campaign to help pay for the massive effort, now underway, to digitize the War of 1812 pension records held by the National Archives. The records documenting more than 180,000 pension records for War of 1812 soldiers and their families are among the most heavily requested documents at the National Archives and, because of their use, their age and their fragile nature, they really need to be digitized to protect them forever. The “Preserve The Pensions” campaign needs to keep raising funds — millions will be needed overall — to digitize all of the War of 1812 Pension Application Files at the National Archives and put them online where they can be accessed free. Every dollar contributed means two pages of a pension file can be digitized — and with matching funds from Ancestry.com, that becomes four pages saved. uly is a month for celebration across the United States. 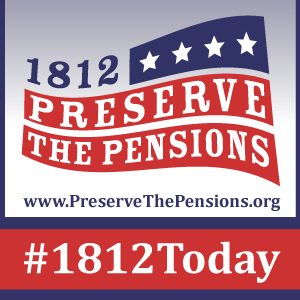 As our families gather for picnic’s and parades, the Preserve the Pensions War of 1812 Committee is inviting you to celebrate the Second Revolution with us. Americans across the country will celebrate our Independence and reflect on the Revolutionary War in the coming days. This month can and also be a time when we remember the “Second Revolution,” the War of 1812, and the soldiers and sailors who fought to ensure that our nation was secure. Today we are launching a fundraising campaign with a lofty goal: we hope to raise $1812 every day during the month of July. Each day you will see updates and progress reports on our social media channels and weekly on this blog. We will be asking you to donate, to share our stories and information, to spread the word of our campaign. Next week, we will be raising up an army of virtual volunteers; all focused on that one goal. This entire project is likely the most significant crowd-sourcing campaign ever attempted in the world of family history, and we are more determined than ever to ensure its success. Genealogists, family historians, educators, military historians, re-enactors, lineage societies, one place studies, one name studies, historians of all kinds… there are many categories of people who will utilize the digitized War of 1812 Pension files, which will remain FREE FOREVER on Fold3.com. We need to reach them all. Spread the word by sharing on social media, using the hashtag #1812today. So far, the initiative has raised more than a third of the money needed, and more than 1.1 million images have been digitzed. But that leaves almost two thirds to go… and millions more records at risk. So… every day … every single day of July … the project wants to raise at least $1812. We can find 1812 pennies in the cushions of the couch, can’t we? We can donate $18 at 12 noon. We can do 18 days at $12 a day. We can donate $180 on the 12th. Or even donate $18.12 every single day. And tell your friends: #1812Today. I’ve been going to donate for over a year. With your help, I finally did it today, and joined the FGS Society of Preservation Patriots while I was at it. Our Happy Birthday for sure! Outstanding, John! Thanks very much — and America thanks you too! Thanks Judy for posting this. I just made a donation honoring my husband’s 3rd great grandfather, Harnden Eddy (1796-1881) who served in the War of 1812. Judy, this is a great way to spread the word about this very worthwhile project. I’m in and will start letting others know as well.